The lone employee of the business reported two suspects, both described as males dressed in black, jumped the counter and demanded money from the register. One of the suspects was armed with a black handgun. 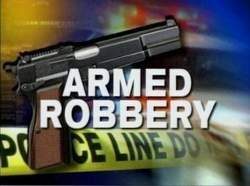 The suspects fled in a dark colored four-door sedan, and the loss was an undetermined amount of cash from the business. Anyone with information regarding the robbery is encouraged to contact the Detective Bureau at (714) 593-4466. Incident #: 17-33003.